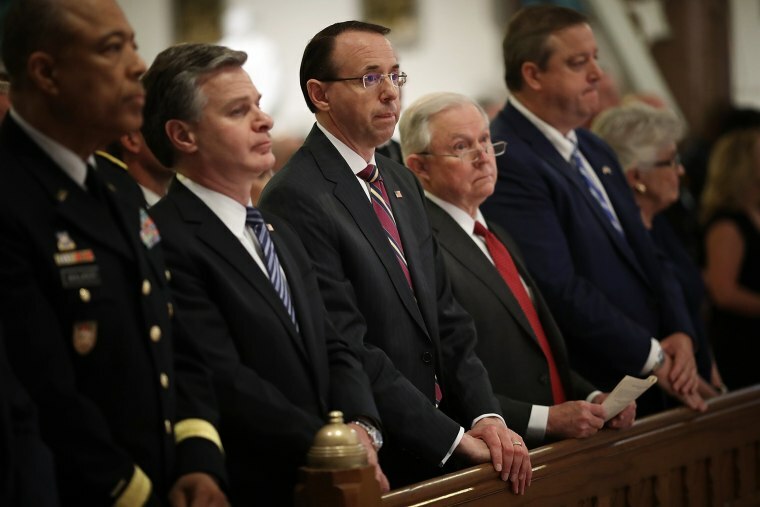 The spat comes a day after Deputy Attorney General Rod Rosenstein said the Department of Justice "is not going to be extorted" by Republicans. President Donald Trump said Wednesday he was considering using his executive power to "get involved" in a document dispute between the Department of Justice and congressional Republicans that's tied to federal investigations into his campaign's ties to Russia. Trump-allied Republicans have been sparring with the Justice Department for weeks over the lawmakers' requests to obtain documents related to the Russia investigation and the Hillary Clinton email probe. It was not immediately clear what Trump means about getting "involved." The tweet earned a quick reprimand from Senate Minority Leader Chuck Schumer, D-N.Y., who told the president, "Do not go down this road." Rep. Jerrold Nadler, D-N.Y., the ranking member of the House Judiciary Committee, argued that Republicans are "clearly trying to sabotage Special Counsel Mueller’s investigation. There is no reason for them to demand key strategic documents about an ongoing criminal investigation except to do damage to the investigation." The Wednesday morning feudingcame a day after Deputy Attorney General Rod Rosenstein said the Justice Department "is not going to be extorted" by congressional Republicans who had drafted articles of impeachment against him over the document dispute.